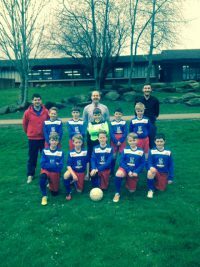 New Directions Education are now the proud sponsors of Ysgol Penrhyn’s football team. This month the business delivered the new kits directly to the children. The squad tried on their football kits for the first time, and were battling between them who will take which number shirts. We got a snapshot of the team with the Team Coach (Mr Owen – left); the Head Teacher (Mr Mathias – middle); and Dan Bailey from New Directions (right). Headteacher, Mr Mathias said of the sponsorship ‘We’re very grateful and the children are delighted with their new kits. At the moment the children are preparing for a big tournament to take place after Easter and are really looking forward to showing off their new attire’. New Directions have been working with Ysgol Penrhyn for the last couple of years, helping to supply staff to the school. Dan Bailey, Senior Account Manager for the Wrexham based team said ‘One of our core values is community, and we are always happy to support the ours. It was great to see that the children are so excited to wear their brand new shirts’.